Round dining tables and chairs offer a more modern style, which is why these teak round dining sets work as attractive focal points in any garden. Perfect for gardens of all sizes, this 4 seater teak round garden table and folding chairs set represents brilliant value for money and can be easily incorporated into any garden or patio setting for the ultimate al fresco dining experience. 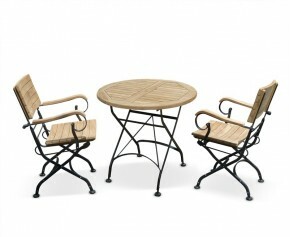 Take al fresco dining to greater heights with this garden round bistro table and 4 arm chairs set. A garden favourite due to its instant recognition, this garden round bistro table and 4 arm chairs set is named after the small French restaurants in which it first classically appeared and is still very much popular today. Take al fresco dining to greater heights with this outdoor round folding bistro table and chairs set. A garden favourite due to its instant recognition, this outdoor round folding bistro table and chairs set is named after the small French restaurants in which it first classically appeared in and is still very much popular today. 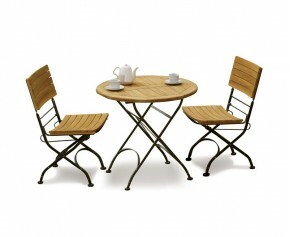 Take al fresco dining to greater heights with this round garden bistro table and 4 chairs set. A popular choice, due to its instant recognition, this round garden bistro table and 4 chairs set is named after the small French restaurants in which it first classically appeared in and is still very much popular today. This outdoor round bistro table and 4 chairs set styled in Grade-A teak and powder coated galvanised steel. A garden favourite due to its instant recognition, this garden round bistro table and 4 chairs set is named after the small French restaurants in which it first classically appeared and is still very much popular today. This stunning drop leaf round garden table and arm chairs set offers solid construction and a traditional style that would look stunning in any garden or patio setting. Expertly constructed in plantation grown A-grade teak for lifelong durability and aesthetic appeal, this drop leaf round garden table and arm chairs set has been built to last. A wonderful addition, this round garden gateleg table and chairs set represents brilliant value for money.Combining the benefits of practicality and style, this handy round garden gateleg table and chairs set can be easily retrieved from storage, what's more the leaves effortlessly fold out allowing you to accommodate extra guests should you need to. This great value teak patio table and stacking chairs set offers solid construction and a traditional style that would look stunning in any public setting or discerning home. Crafted by experts in sustainable Grade-A teak, this robust outdoor garden dining set has been built to last and can be left outside all year round with minimal maintenance. Add a touch of luxury to your outdoor setting with the addition rattan table and 4 chairs set. Expertly manufactured in 'soft to touch' synthetic Rehau flat-weave wicker woven over a sturdy aluminium frame, this glass top rattan table and 4 chairs set offers the ultimate indulgence for your indoor or outdoor experience. 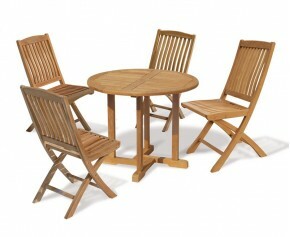 Recline and dine in the ultimate comfort with this 4 seater teak round garden table and chairs set. Expertly manufactured in plantation grown genuine A-grade teak for lifelong durability and aesthetic appeal, this 4 seater teak round garden table and chairs set is solid, stylish, functional and easy to maintain. From our contemporary Canfield and modern Monaco, to our classical Bistro and Lutyens, we offer a wide variety of outdoor dining sets for you to choose from. However, we can’t expect to meet everyone’s needs perfectly even with these stunning round dining sets. That’s why we are proud to present our bespoke furniture service. Craft your perfect garden dining set by selecting the “product customisation” option on any product page, list the changes you require and our master craftsmen will get to work on your dream furniture. Don’t miss out on your perfect round dining table and chair set. Highly sought after by our high-end cafe and resort centric clients, these stunning round dining table and chairs sets are now available to our respected residential customers. 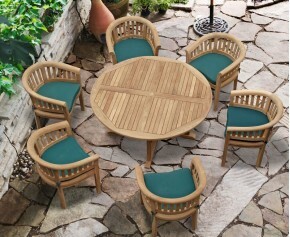 Bring an element of luxury resort to your humble garden with one of our round dining sets. Built to withstand constant use and year round exposure to the elements, these circular dining table and chairs not only present timeless style but unmatched durability in an unbeatable value for money deal. Don’t miss out, see our range of round dining sets above.